The Killino Firm legal team has the winning combination of skilled, experienced and aggressive attorneys supported by diligent and experienced paralegals, legal assistants, investigators, medical professionals, interpreters and other support staff. This winning legal team, not one associate or some paralegal, will handle your case. The Killino Firm employs a team approach to make The Killino Firm Difference. 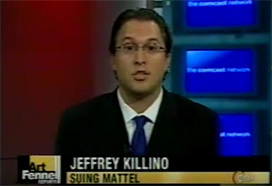 The Killino Firm legal team develops winning legal strategies and game plans for every case. This team approach sets The Killino Firm apart and this team keeps The Killino Firm at the forefront of major Product Liability, Auto injury and Wrongful death cases such as Mattel toys, Chinese tires and Tainted Heparin. While in the courtroom and at trial The Killino Firm are second to none, success stems from the team approach in handling all aspects of the case leading up to the trial. Civil lawsuits encompass many tasks and phases that are just as important as the closing argument. The phases and tasks include investigation, legal research, legal briefing, motions practice, discovery, depositions, expert opinions, trial prep, mediation, mock trials and of course the trial itself. Although every attorney at The Killino Firm has the skill and experience to handle all aspects of your case, as part of the legal strategy and team approach individual team members are selected to lead key tasks and phases of each case. This team approach and the efforts of The Killino Firm team members in preparing for trial and winning those pivotal Courtroom/legal battles throughout the case are why so many Defendants refuse to go to trial against The Killino Firm and consequently settle. The individual Killino Firm Attorneys working together as a winning team make The Killino Difference possible. When you need a lawyer who will exhaustively investigate your case and make sure that every responsible party is held accountable, contact The Killino Firm, where Keeping America Safe is our primary goal. To speak with one of our attorneys, call us toll free at 877-875-2927, or email us to contact an injury attorney. We will respond promptly to your inquiry so that you can experience The Killino Firm Difference.